Shinwa Colossus Yoru Handmade Odachi / Giant Samurai Sword - Exclusive, Hand Forged Black Damascus Steel; Genuine Ray Skin; Dragon Tsuba - Functional, Full Tang, Battle Ready - 60"
Like some terrible mythical beast, Shinwa’s “Colossus Yoru” Odachi is enormous, powerful and downright frightening. And for good reason! At a monumental 60" long overall, with a fully functional, razor sharp 36" blade, this imposing two-handed samurai sword packs awesome might, savage bite and untamable brutality on par with the biggest, baddest, most terrifyingly oversized beasts of lore. But unlike the Titans, Cyclops, Goliath, the Nephilim or any other giant(s) of legend, the monstrous Colossus Yoru is real. Very real. And reality can be far scarier than fiction – especially when you’re on the receiving end of this potent Shinwa odachi. A hulking brute adorned in the trappings of royalty, the Colossus Yoru dons all the aesthetic hallmarks that make traditional Japanese cutlery so visually appealing, plus plenty of smart contemporary updates and chic original appointments that epitomize Shinwa’s knack for combining the best of old and new, fusing tradition with innovation. 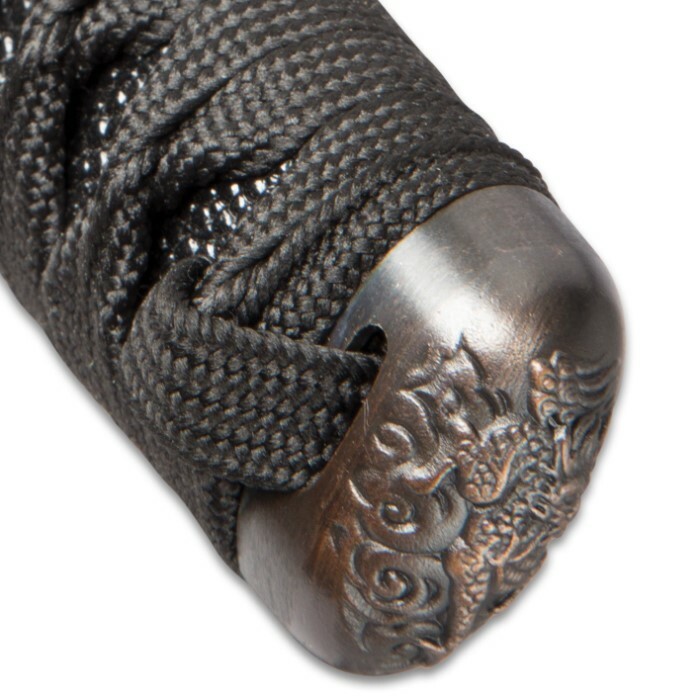 Delicately textured genuine ray skin same and braided ito cloak the tsuka, which is gracefully elongated to accommodate two hands, boosting leverage, improving control and counterbalancing the hefty blade for an ideal center of gravity. 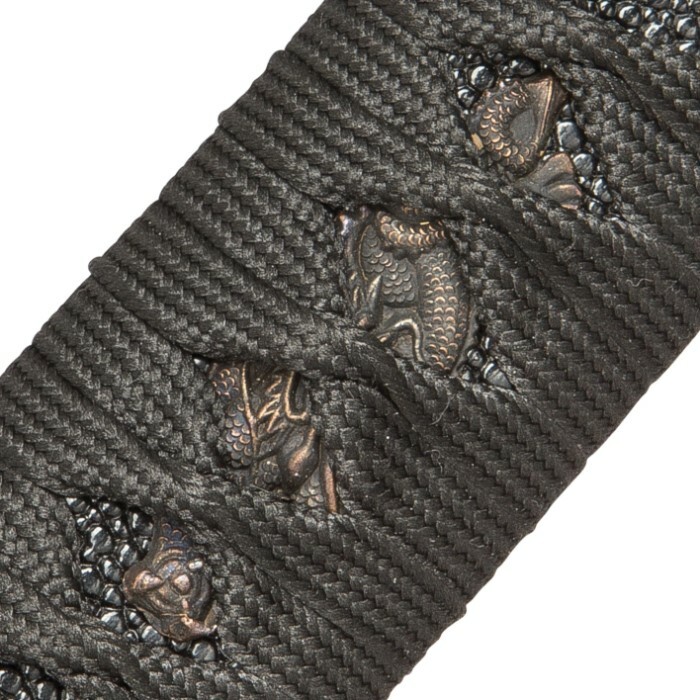 Flawlessly cast, the tsuba bears an intricate, exquisitely detailed dragon motif and is bathed in a rich, warm patina for a charmingly antiqued look. 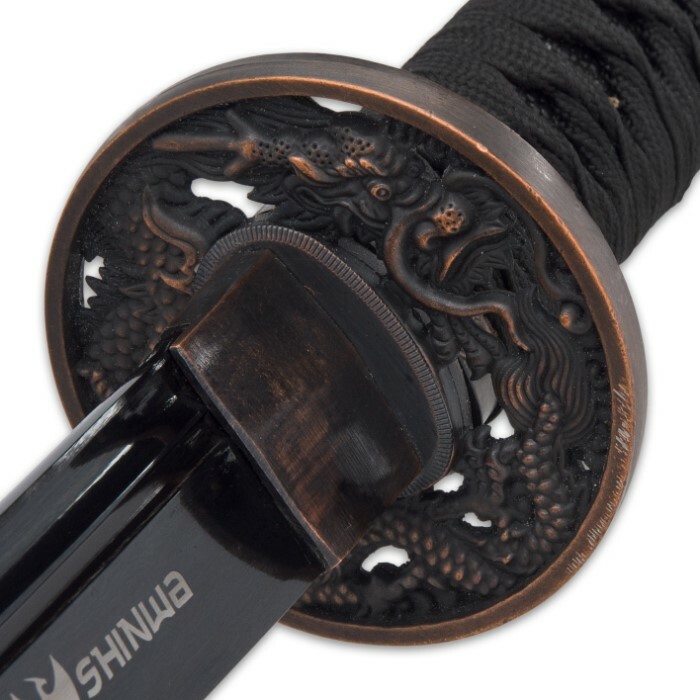 And while most Japanese swords’ style and allure is concentrated at the tsuka, rarely extending onto the unexciting, largely utilitarian blade; the Colossus’ blade is teeming with visual splendor – a breathtaking wonder in its own right. Hand forged from black Damascus steel, the bewitching super-sized tanto blade is a tumultuous sea of contrasting lines, waves, swirls and other mesmerizing patterns. Each line is a distinct variety of steel, hammer welded and hand folded repeatedly to yield the more than 2,000 layers in each Colossus Yoru blade. The unique metalsmithing technique’s roots stretch back to the Middle Ages, and today it’s still painstakingly performed by seasoned hands – no automation, no mechanization. To make each Colussus Yoru blade, a Shinwa master swordsmith fires a stack of steel blanks - each piece a different alloy - in a white-hot forge until the metal glows red hot. He then removes the stack and hammers it until it’s around half as thick as the original. Then he folds the metal onto itself lengthwise and hammers each half together. The process is meticulously repeated – hundreds of times in some cases – until the desired layering effect is achieved, at which point a final quenching strengthens the resulting blade blank and an acid etching highlights vivid contrasts in the layers. And the slow, laborious process itself it just the beginning! In order to achieve sufficiently dramatic contrasts, Shinwa’s master smiths must expertly select an appropriate combination of steel alloys of varying color, luminescence and other visual qualities. For the sake of strength, resilience and countless additional blade factors, the smiths must also must consider each alloy’s distinct melting point, proper stacking order, forge temperature and myriad other variables. Simply put, an unbelievable quantity of blood, sweat and tears goes into every Colossus Yoru blade. 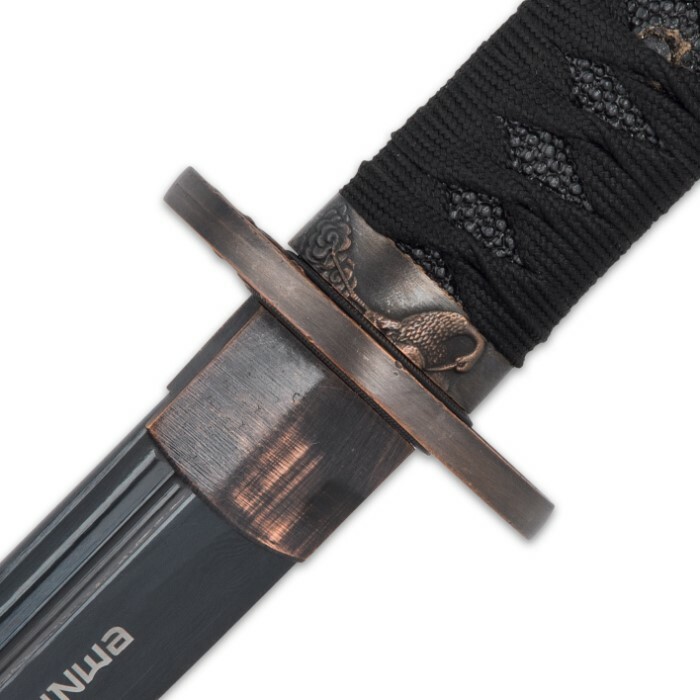 As if that weren’t enough, Shinwa adds its own innovative modern twist to the Colossus Yoru blade - an exclusive, closely guarded secret process that imparts its distinctive shadowy hue; putting the “black” in black Damascus, so to speak. Rich amber lines swirl over a deep black void like trails of blood flowing down a blackwater river. It's Damascus steel...after dark. And of all the world’s swords, Shinwa’s Colossus Yoru – which translates from Japanese to “Colossus of the Night” - is one of a relative few to feature it. Furthermore, like a steel snowflake or fingerprint, the patterning on no two “Yoru” blades is exactly alike. From beauty to power to originality, everything comes bigger on the Colossus Yoru. This large-and-in-charge odachi casts a far-reaching shadow that obscures other swords, making them seem comparatively dim and lifeless. Even far more expensive custom odachi tremble in the shadow of Shinwa’s black Damascus “Colossus of the Night.” Upon wielding it for the first time - experiencing the raw, unbridled energy and might it conveys with every swing – you’ll never want to put it down. But much as you may want to, you can’t clutch it 24/7; thankfully, the Colossu Yoru is perfect for display. The elegant yet in-your-face odachi demands attention and admiration, especially when mounted on a wall or perched atop a handsome sword stand. And, of this, you can be sure: what the mighty Colossus Yoru demands, the mighty Colossus Yoru gets. Pictures do not do it justice! Shorter than my other Odachi swords, and the length of the handle makes it more akin to a nagamaki. No complaints though, cut through the rolled mats with little effort, great balance, and did I mention that it's ABSOLUTELY BEAUTIFUL!!!! 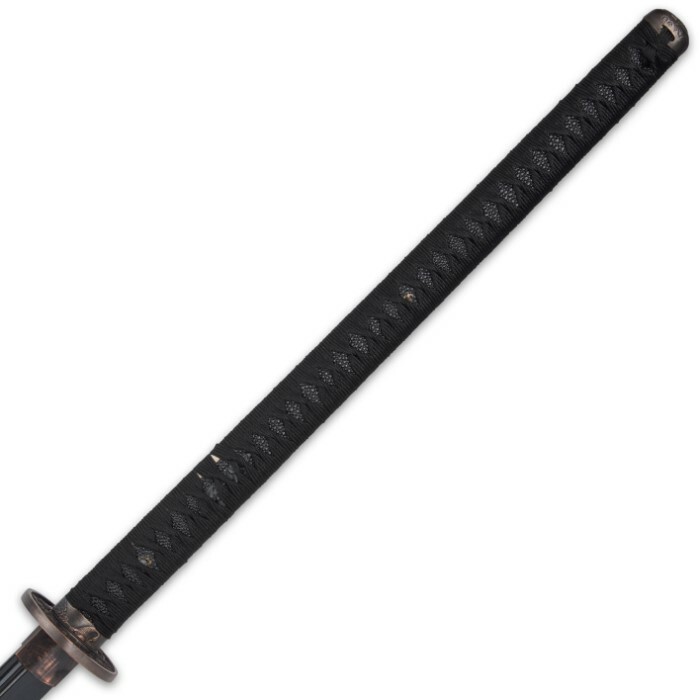 Cannot believe the price, I spent $6000 on my demonstration Odachi, and I LOVE this one more! 35+ years of kinjutsu, highly recommend. This is an incredible weapon. Massive design makes the Sword feel huge in your hands, yet it's elegantly balanced so it doesn't have too much weight unbalanced. The blade is black and sleek and gorgeous. The whole design has a very dark, sinister feel to it, as if it were a sword made for the villian to wield. I absolutely love it, it's immediately become one of my new favorite swords in my collection. I would highly recommend, especially for the price, you're getting an amazing weapon for the cost of an entry level katana, I feel it's definitely worth it. The picture is a bit misleading, as the habaki isn't gold, but rather the same color as the tsuba and other fittings. The sword came with some minor blade damage, including several small nicks and a slightly bent upper third of the blade. However, the bend was easily fixed by placing it into a vice and carefully readjusting it. Also, The tsuba rattles slightly when swung. As these issues are specific to my blade, I wouldn't worry too much about them if you're thinking about buying the sword. Every blade is different. Speaking of the blade, it has a beautiful geometry. There are two fullers. The wider of the two stops about a third of the way down the blade's length, while the narrower one almost reaches the tip. The second half of the sword is also double beveled, though only the side meant for cutting is sharpened. The tip is fully formed and very sharp, but isn't perfectly symmetrical upon close inspection, but that's to be expected when dealing with a cheaper sword like this. The handle feels sturdy, but the wrapping isn't very tight. It shifts when swung, revealing the wood of the handle. It's nothing major, but still a nuisance. It makes me wonder how well the wrapping would fare during heavy cutting. If I had to guess, not well at all. The rayskin is also crudely cut and put into place, so that it's sticking out at the edges. If you're like me, and upon arrival the black oxide finish doesn't look as cool as imagined, it's easy to remove with nail polish removal, leaving behind a nicely shaded, more traditional silver color. Unfortunately, the logo and numbering are etched in, and no amount of nail polish remover will get rid of them, though once the oxide finish is stripped away the logo becomes far less easier to notice. The blade handles moderately well. Its point of balance is about five inches from the handle. It feels nimble, and is easy to control. My blade came very sharp, and cut with ease when doing light test cutting (water bottles, jugs, cans, etc.) As said before, I'm not sure how the sword would handle heavy cutting. While it has a lot of issues, it's price more than makes up for them. It's rare to find a nice odachi (meaning, one that doesn't fall apart when swung) at this price, and if you're looking for one for light test cutting or to hang on the wall, you'll likely be satisfied. The is the first Odachi sword I brought. It was cover in oil,so I clean the sword first.The sword has a nice edge,the handle on the sword was tight and it cut through four milk jugs full of water with little effort on my end.It is well balanced and I feel it can easily cut through a man with no issues. It is worth the money.My only complaint was the logo and the number on the blade.Made it look like a mall brand store,but it is truly a battle ready sword. Disgusting. The conventional steel, the pattern of the Damascus erased. Quality arm miserable. Only after replacing the handle on the smaller, can be used. Or as a decorative element. I look at the sword and I wonder whether this is truly a damascus blade. The pattern on the blade looks awesome but it does looks like the pattern could be rubbed off. Maybe that is just from the high gloss on the blade. The point of the blade is very soft and can be bent quite easily. Of course this is typical of swords under $200.00. The sword is light weight and well balanced. Despite the fact the sword is five feet long, I am able to move quite fast with it. I would not call this a battle ready sword but it can be used for demonstrations and some light cutting. And, the sword displays quite nicely. 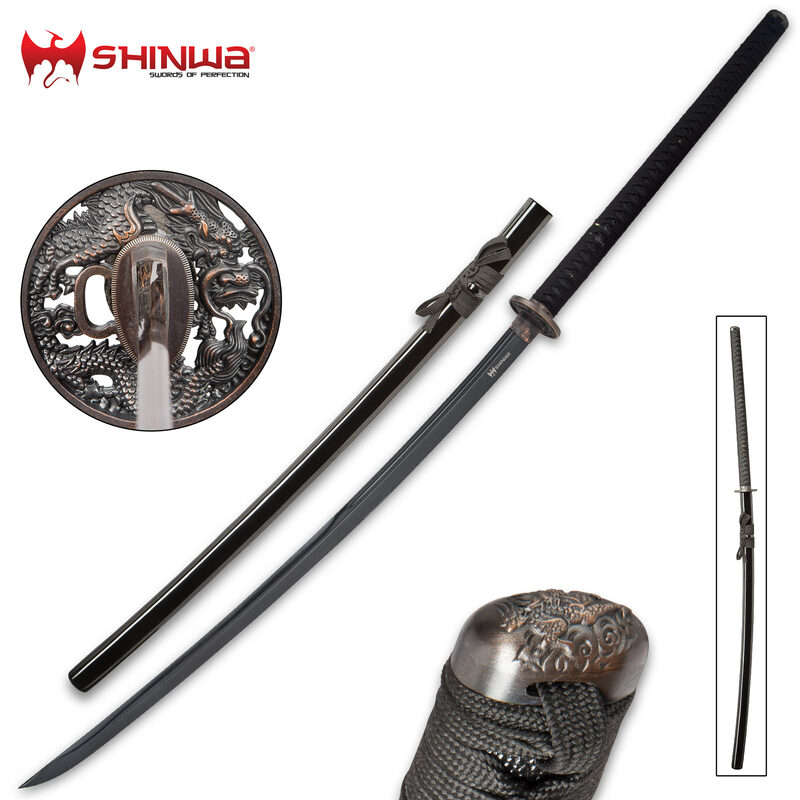 This is a very beautiful sword of amazing quality for the price. I have two other odachi swords. Yes, they are both longer swords and a bit cheaper. However, they are toys, merely display pieces compared to this shinwa odachi. No Comparison!! The next time I buy a sword. It WILL be a shinwa. Special shout out to budk for the SUPER FAST delivery. All but overnight service for the normal price! Thank Thank you! This Sword is a Freaking Monster! The handle is almost as long as my Dark Dragon Katana! This sword is of the Highest Quality, Solid, Straight, and Razor Sharp! This is my second sword of 2 that I got for my Birthday, the other sword is the Dark Dragon Damascus, and they are both awesome! This sword is massive and Deadly, I am so impressed with the sheer size and weight, it's so evenly Balanced and everything is very Tight. This sword is 5 feet long!! The Blade is gorgeous, the folded Damascus steel is beautiful in person, the picture does not do it Justice. It took me a long time to make my choices, I read all the reviews and as far as it being a real sword or real Damascus, or not Battle Ready, unless your Duncan MacLeod from the show "Highlander" I doubt your going to Battle anything other than a pumpkin or a jug filled with Water! However it's nice to know that if you had to take this sword in to Battle, you would be Wielding a most Deadly Weapon and it would do you proud. 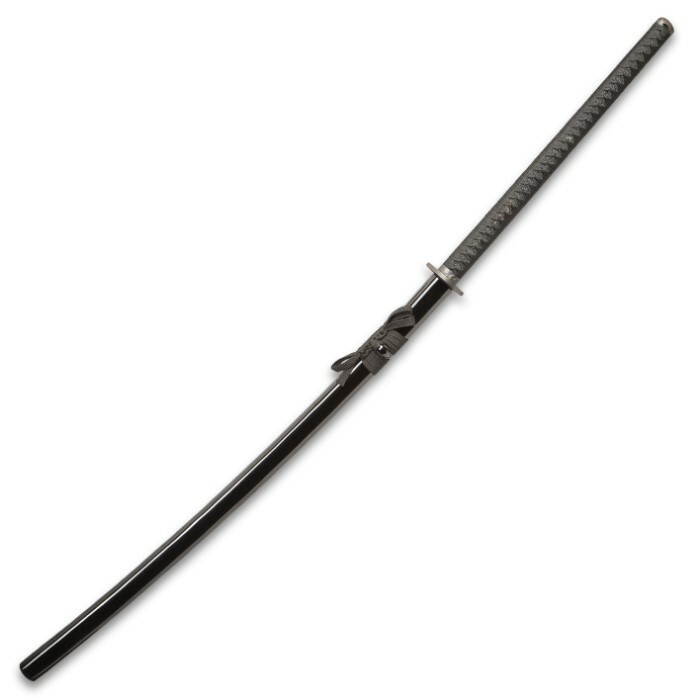 With Swords of this Quality available to us, the only way I would pay a $1000.00 to $5000.00 for a sword, is if I wanted an original antique Japanese Sword from the 15th century, and then it would sit on a wall for the rest of my life. Buy this sword, the Price is right and BudK is an awesome Company! Thanks BudK!! em>Editor's Note: Thank you for your comments. We have removed a portion of the review which does not comply with our review guidelines.